When I got a bag of tamarillos from Frieda's Specialty Produce, I was both intrigued and confused. The were a bright magenta-red and they had long stems firmly attached. They were sort of football-shaped, but with rounder ends. Their nickname is "tree tomato." They can be eaten cooked or raw, but the skin allegedly tastes terrible. Some recipes I found suggested that they be used sort of like tomatoes, while others suggested they were for dessert. I decided to blanch and peel them, since that seemed easiest. The skin was thicker than what you'd find on a tomato or even a nectarine. More like a ... hmmm ... I'm not sure what. Thinner than a mango, but that's about as close as I can think of. They peeled easily once blanched and the inside was the color of the inside of a peach or apricot. I tasted, and it was tart. Reminded me of citrus or maybe slightly underripe peaches. I took another sample, and the inside - the seedy part - definitely had essence of tomato. Since my blanching had softened the fruit a lot, I decided to cook them. So I chucked them into a pot and made a sauce. The fruit broke down really fast - faster than cooking tomatoes or apples. And it turned a magenta-red as the color of the interior of the fruit blotted out the peachy-orange of the outer flesh. The flavor of the finished sauce was just as confusing as the raw fruit. The sugar I added balanced the acidity a bit, but it was still that mingled fruit-citrus-tomato flavor. I asked my husband to taste it and tell me what it reminded him of. First he said plums, then he said it was more like tomatoes. Weird and weirder. After the sauce was made, I brainstormed what to do with it, and I decided to try it as a marinade on chicken. I pounded some boneless, skinless chicken breasts until they were evenly flat, then put them in a plastic bag with a few large dollops of sauce and let them marinate for about 30 minutes. I heated a pan, added some olive oil, and let the chicken brown a bit on one side, flipped it, and browned on the other. I continued cooking until it was done all the way through. The marinade added a nice sweet-tartness to the chicken. Now that I've tried it, this would be really good on pork, too. But ... oops ... I didn't get photos of the chicken. Just imagine it, huh? 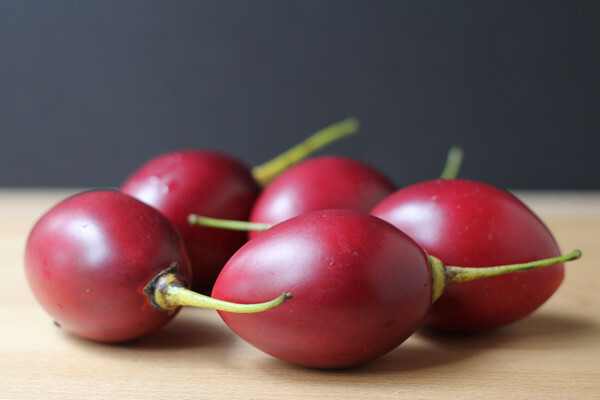 Cut the peeled tamarillos into a few chunks and put them in a saucepan with the water, sugar, and salt. Cook until the fruit is completely softened. Pass the puree through a strainer into a bowl to remove the seeds. Discard the seeds. Taste the sauce, and add more sugar or salt, if needed. Mine was still pretty tart and I liked it that way, but if you want something on the sweet side, you might want more sugar. Refrigerate the sauce until needed. I received the tamarillos from Freida's Specialty Produce.